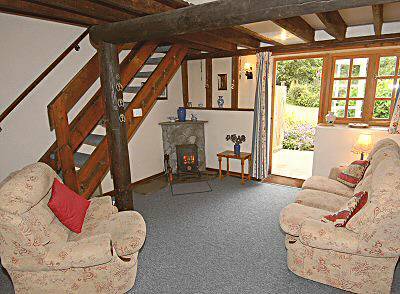 There is a feature stone fireplace with log burning stove (that you may use), a high quality matching three-seater sofa and armchair, flat screen digital TV and DVD player. The dining area has a pine table and four chairs. There are also two night storage heaters and an electrical convector. A selection of reading books, magazines and brochures of local attractions are also provided. 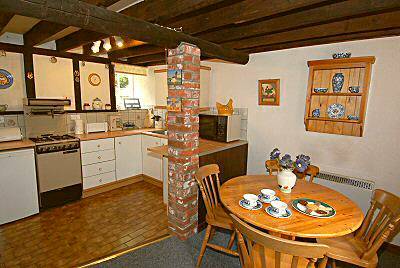 The kitchen area is well equipped and includes a dishwasher, microwave, new electric cooker and refrigerator. The rear door opens to a patio area with table and chairs and a small garden which leads into the main grounds of the manor house. Stairs lead to the master bedroom with a pretty antique style pine bed and matching furniture. Also has shaver point and clock radio. 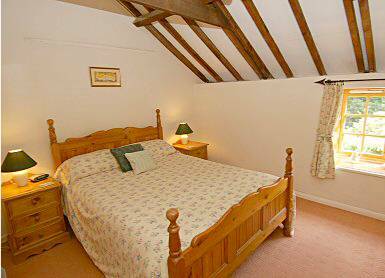 Both bedrooms include antique style pine furniture and exposed beams and electrical wall heaters. 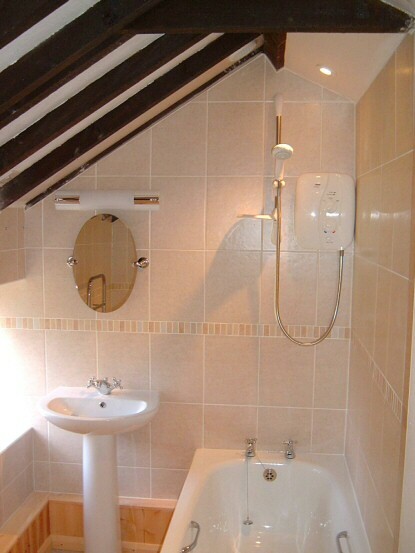 The recently refurbished bathroom includes electric shower, bath, wash-basin, shaver point and toilet. Also has an electric heated towel rail and fan heater. Hot water is provided by timed immersion heater with boost facility. Electricity, bed linen and towels are included. Solid fuel, if required, may be purchased from us (subject to availability) or bought locally. Cottage warm & cosy & well kitted out...Bed very comfortable (we were hoping for rain so we could stay there all day! !...It's been a very relaxing & thoroughly enjoyable few days. Excellent place for recharging the batteries. Thanks for a lovely time. The Coach House - a more spacious characterful stone-built cottage with full central heating that sleeps from two to four plus cot.